This month on November 22, the Women in AI in Healthcare Dinner returns to London for the second time. The event will showcase leading female minds in AI in healthcare, and is open to both men and women keen to support women in the industry. With increasing opportunities for AI in healthcare such as virtual assistants, personalised medicine and improved medical diagnosis we’re looking forward to welcoming both women and men from industry, academia and startups for an evening of discussion and networking. By 2021 the AI in healthcare industry is predicted to reach a value of $6.6 billion. 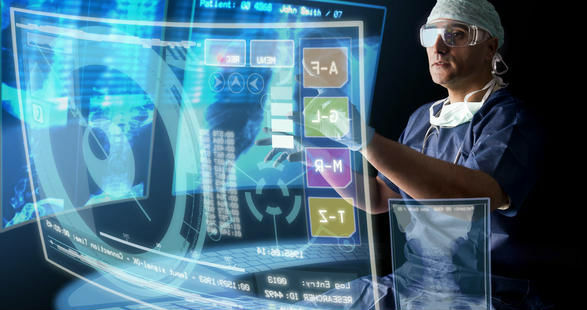 With public institutions such as the NHS planning to invest more of its £120bn budget into AI we caught up with our leading ladies from Babylon Health, the University of Manchester and the Institute of Cancer Research on their current research and topic's they'll be covering at the dinner. What can the healthcare industry do to aid the uptake of AI and facilitate change within the sector? AI is having an impact in three major areas of Healthcare: doctor facing AI, consumer facing AI and pharmaceuticals. Pharmaceutical companies are already incentivised to have the most up to date technology for drug discovery, whether gained through research or acqui-hires, so I’m not sure what else they can do aside from putting even more money into it. Doctor facing AI, (e.g. medical imaging technologies, or technologies which read signals such as ECG) will be used more and more as they are proven to be more accurate. The main blocker to making these technologies better is simply the lack of data. Large datasets of tagged images and signals currently exist, but are not being fully utilized. The most interesting and complex dynamics are found in the third area, consumer facing AI. A lot of the technologies here are either inherently disruptive (like the AI GP we are building at Babylon) or are creating completely new sectors (like the personal monitoring/testing tech of Fitbit and 23andme). I think change will happen here regardless of what incumbents of the healthcare industry do to facilitate it - the need is strong and AI technology too suited for it not to happen.The speed of uptake of AI will rely on how quickly the tech can be integrated into consumer products and how the consumers respond to it. People will be concerned not just with the accuracy, but also how easily the results and reasoning of the AI can be interpreted, therefore the most important thing to do here is make the models interpretable and predictions well explained. Farideh Jalali, Doctor of Computer Science at the University of Manchester, is working to bring insight from the field of machine learning to solve clinical problems that can provide clinicians with actionable information. At the dinner, Farideh will be discussing the application of machine learning methods for disease prediction in high risk groups. She spoke briefly with us about the progressions of AI in healthcare and some of the problems AI can help to solve. To suggest the next steps to the nurse for a patient’s diagnosis. Patients who feel a little unwell or think they need to seek medical advice will dial into a telehealth service and talk to a nurse. Data on their symptoms may be uploaded in real time from a smartphone and the AI system will suggest the next steps over the phone. Simmy Grover, our host for the evening is the Chief Science Officer at Unmind. Her role is to ensure the academic and scientific validity of Unmind’s platform and interventions. Simmy is an organisational psychologist, who is completing a PhD in Organisational Psychology at University College London, with research including individual differences, interpersonal relationships, organisational processes and structure. If you're keen to support women working in AI & Healthcare, join us for the Women in AI in Healthcare Dinner in London on November 22nd. Whilst the line up of speakers is all female, we are excited to welcome a diverse audience of both men and women for an evening of presentations on healthcare research and applications as well as a three course meal and wine, with a champagne reception kindly sponsored by Insilico Medicine.